Songkhla, Thailand, April 8.— Prof Tan Sri Dato’ Dr. Sharifah Hapsah binti Syed Hasan Shahabudin, the Vice Chancellor of Universiti Kebangsaan Malaysia, was today conferred the Honorary Doctorate of Educational Administration by Yala Rajabhat University in recognition of her outstanding academic work and administrative leadership. Prof Tan Sri Sharifah received the award from His Royal Highness the Crown Prince of Thailand, Prince Vajiralongkorn at the University’s graduation ceremony. In her citation, Prof Tan Sri Sharifah, 62, the Yala Rajabhat University recognised her for her outstanding academic achievement while she was holding a position of Chairman and CEO of National Accreditation Board, and for her work in establishing the Malaysian Qualification Agency and the accompanying Malaysian Qualification Agency Act as well as implementating the Malaysia Qualification Framework. The citation noted that Prof Tan Sri Sharifah was highly experienced in managing Higher Education institution with a great success in education development that is widely recognised at the international level. She is also involved in medical science education. She has worked collaboratively with the Yala Rajabhat University with a strong involvement and close cooperation to the great extent that Yala Rajabhat University successfully achieved its effort to establish the Programme of Teaching Islamic Education which enhance the positive and far-reaching development in education in the lower-southern provinces of Thailand. The citation said, the Yala Rajabhat University agreed to award Prof Tan Sri Hapsah binti Syed Hasan Sahabudin the honorary doctorate degree in Educational Administration. Yala Rajabhat University, is the first outstanding higher education institution in Yala Province, authorized by office of Higher Education Commission, Ministry of Education, Thailand. The university, was primarily upgraded in 1962 from teacher training Division, Ministry of Education, Thailand, offering undergraduate study in education in order to prepare qualified teachers for elementary and secondary schools in the southern border provinces. The year 1992 was considered the exceedingly auspicious year when the college, along with other 35 teacher colleges around the kingdom were appointed by His Majesty king Bhumibol Adulyadej the higher status with the honorable name Rajabhat lnstatute. Since then, Rajabhat institute Yala, RIY, has continuously expanded its curriculum to offer various bachelor degree programs to the large extent as a way to meet the need of the local residents in the community. 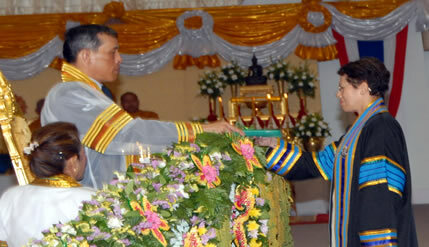 Emblem of the university is the Royal seal of His Majesty the King Bhumibol Adulyadej, graciously conferred to the University on February 14, 1992.